A protestor at an anti-BP rally in Berkeley, California in May 2010. Three years after a deadly explosion on a BP-leased drilling rig unleashed the worst environmental disaster in US history, the British energy giant is fighting to avoid billions in fines. Three years after a deadly explosion on a BP-leased drilling rig unleashed the worst environmental disaster in US history, the British energy giant is fighting to avoid billions in fines. BP's lawyers are trying to convince a federal judge that the 2010 Gulf of Mexico oil spill was not a result of gross negligence and to shift some blame—and cost—to its subcontractors at a blockbuster trial in New Orleans. But after weeks of damning testimony describing how BP and its subcontractors ignored multiple warning signs prior to the April 20 explosion aboard the Deepwater Horizon, experts say the case against BP is strong. "There's been an awful lot of evidence indicating they (BP) ignored normal procedures and were in effective control of the oil rig platform even though it was owned by Transocean," said Ed Sherman, a Tulane Law professor who has closely monitored the case. A finding of gross negligence increases the maximum potential fines under the Clean Water Act to $17 billion from $4.5 billion and leaves BP open to punitive damages in other claims. US Coast Guards battle the blaze at BP's Deepwater Horizon well in the Gulf of Mexico in April 2010. BP's lawyers are trying to convince a federal judge that the 2010 Gulf of Mexico oil spill was not a result of gross negligence and to shift some blame—and cost—to its subcontractors at a blockbuster trial in New Orleans. US District Judge Carl Barbier has discretion in determining how much of a penalty to impose and whether rig operator Transocean and subcontractor Halliburton, which was responsible for the runaway well's faulty cement job, should pay a portion of the spill's massive cost. "That's the multibillion-dollar question—how much fault will Judge Barbier actually allocate amongst the parties," Loyola University Law School professor Blaine LeCesne told AFP. "The more fault that's allocated to the subcontractors, the less likely it would be that BP is the lone culprit and is found to be grossly negligent." 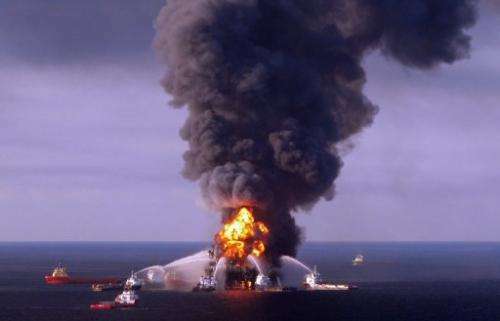 It will be years before the spill's total costs are known as BP remains on the hook for billions in additional damages, including the cost of environmental rehabilitation. It took 87 days to cap BP's runaway well that killed 11 workers, blackened beaches in five states and crippled the region's tourism and fishing industries in a dramatic tragedy that riveted the United States. 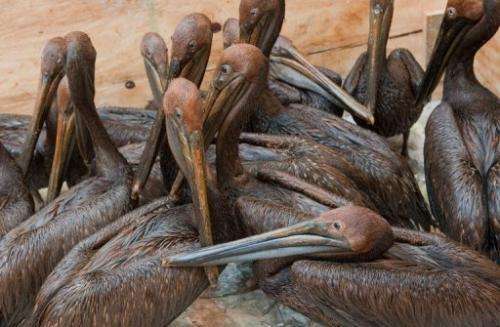 Oil covered brown pelicans found off the Louisiana coast await cleaning in Buras, Louisiana in June 2010. After weeks of damning testimony describing how BP and its subcontractors ignored multiple warning signs prior to the April 20 explosion aboard the Deepwater Horizon, experts say the case against BP is strong. BP spent more than $14 billion on the response and cleanup and has paid another $10 billion to businesses, individuals and local governments that did not join a class action lawsuit currently fighting for compensation in Barbier's courtroom. It also pleaded guilty in November to 11 counts of felony manslaughter in a $4.5-billion deal to settle criminal charges. 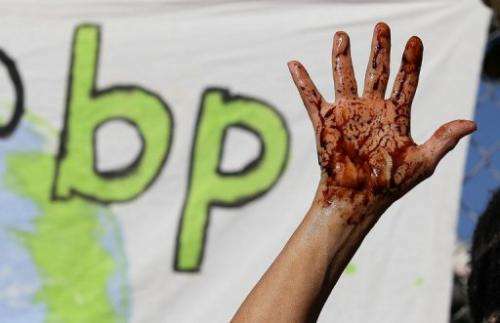 BP hailed the success of its recovery efforts in a pamphlet released ahead of the disaster's third anniversary Saturday declaring that "no company has done more to respond in the wake of an industrial accident than BP." "It is clear that the dire predictions many made about the future of the Gulf have not come to pass," wrote Geoff Morrell, BP's head of US communications. Tourism numbers are "smashing records," commercial and recreational fishing catches are coming in at their highest levels in years and "the environment is returning to baseline levels," BP said. Yet environmentalists say it's too early to declare victory. 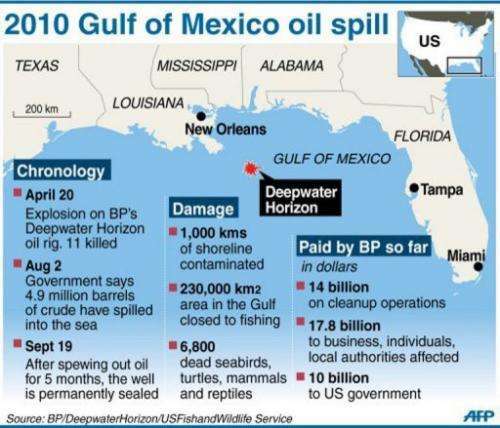 Factfile with map on the 2010 Gulf of Mexico oil spill. US District Judge Carl Barbier has discretion in determining how much of a penalty to impose and whether rig operator Transocean and subcontractor Halliburton, which was responsible for the runaway well's faulty cement job, should pay a portion of the spill's massive cost. "Given what's happened in other major oil spills it's not at all unlikely that we're going to see damage show up that won't be visible for years to come," David Muth of the National Wildlife Federation said in an interview. The spill accelerated the loss of fragile coastal wetlands that help protect New Orleans from storm surges and serve as a nursery for much of the Gulf's marine life. While a large part of the research remains sealed due to the pending litigation, public studies have found impacts from the top to the bottom of the food chain, such as oil components in plankton and huge spikes in the number of dead dolphins and sea turtles washing up on shore. The good news is that BP and the US government are not waiting for the court battle to end to start working on coastal restoration projects. The National Fish and Wildlife Foundation will receive $2.5 billion from the criminal settlements for environmental restoration, preservation, and conservation efforts. BP has also directed a further $1 billion towards early restoration projects. In the meantime, crews continue to collect the tar balls that get keep washing up on beaches every time a big storm stirs up the sand offshore.